We Americans have accepted canned tuna, sometimes even sardines and anchovies, but that seems to be about it for mainstream canned fish. German supermarkets, however, have entire shelves dedicated to canned, jarred, pickled, smoked, and cured fish of all colors. Maybe it’s just that my american taste buds have not yet adapted, but I tend to avoid this entire section of the supermarket. Yes, I have occasionally tried the ever popular herring (most commonly mixed with horseradish and mayo into some kind of salad) but, for now anyway, I am happy to generously give my portion to my German husband. This recipe does take some time, but very little of it is actual hands-on time. The first day I cured the salmon in a mix of salt and sugar. On day two I boiled the potatoes and packed everything in jars with olive oil, vinegar and some spices. And on day three I served the salmon and potatoes, as per Dorie’s suggestion, with hearty buttered farmhouse bread and a squirt of lemon. Final verdict: My husband really enjoyed it and I was actually pleasantly surprised. The salmon is cured, but very lightly so that it tastes more like fresh salmon than gravlax. The potatoes were also quite tasty and all in all I’m happy that I gave this one a try. Who knows, maybe I’ll even make it again. This entry was posted in french fridays with dorie and tagged Around my French Table, bread, fish, german food. Bookmark the permalink. HI, nice of you to drop by my blog to see how the salmon in jar fared 🙂 it was great experience for me…curing the salmon with just salt and sugar :p yea, it was well flavored and none of us had any food poisioning…hahaha I will make it again for I love salmon . Oh, I’ve forgotten all about the German propensity for preserving all sorts of fish, even eel! When I lived there, I avoided that supermarket section too, so maybe it’s not just an American thing. Yo were right, the salmon was only very slightly cured so it tasted a bit like salty sashimi. We liked I too :-). Too true, I haven’t given the smoked eel a try yet, but maybe after I’ve been here a bit longer. Glad you enjoyed this – we were a bit “meh” but I am happy I amanged to make it on holidays anyway! This was definitely an adventurous one for me and one I would not have tried if I was not participating in FFwD. In fact, I’m actually impressed with how many actually tried the recipe. I’m glad you were pleasantly surprised! I love that blue glass in your pictures. Pretty! Why thank you, a friend bought them for me years ago and I admit that I didn’t like them at the time. But apparently my tastes have changed (and I moved into an apartment with a blue kitchen) because now they are my favorite wine glasses. I love the way you presented everything – and as a sidenote, that bread looks divine – and happy everyone liked the salmon! I was not expecting it to be as universally liked among my friends and family either so I think I will definitely be making some more! Looks fantastic! Glad you and your husband enjoyed it. Good for you for trying it. I love the look of your bread. That must have been great with the salmon! its nice to be pleasantly surprised! I enjoyed my salmon too, both in and out of the jar! Your table is just beautiful. I am so glad you enjoyed this one, too! What a lovely spread, Rosa! I’m glad you and your husband enjoyed this recipe. It definitely looks like it was fun to eat. I’m still on the fence about this one. You did such a lovely job on this one…Wish I was sitting at that table…just a beautiful spread! I passed on this one for all the reasons you stated in your post! Never could get used to gravlax. Have a great weekend! know a little bit about curing. Rosa, you are so right about herring being a hard sell to Americans. That’s a fish I just can’t seem to acquire a taste for, one of the only ones… I really loved this one. Your farmhouse loaf looks delicious. Is it homemade? I’d love to say that I can make homemade bread, but to be honest I’ve never managed it. It’s a very popular bread in Germany called Bauernleib brot. Which I think roughly translates as farm life bread. In any case, it’s one of my favorites. I think this recipe was challenging for a lot of us. 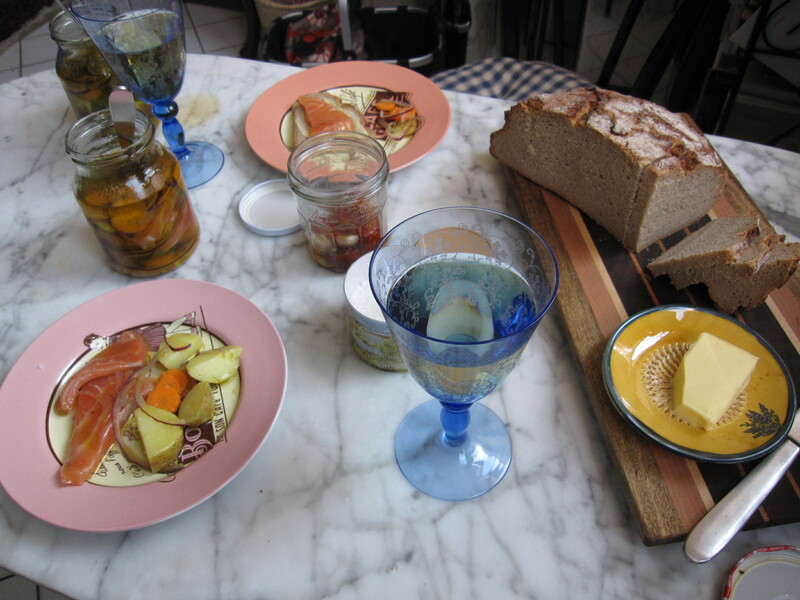 I made the bonne idée version of the salmon and jarred the potatoes – I quite liked both.